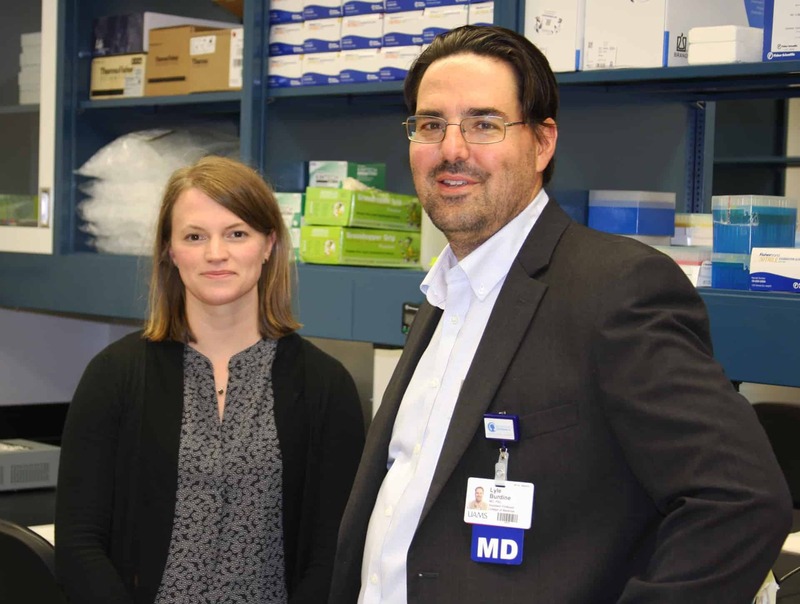 Lyle Burdine, M.D., Ph.D., and Marie Schluterman Burdine, Ph.D., are part of a team of UAMS researchers that believes an enzyme has been identified that could provide immunosuppression after transplant surgeries. Sept. 6, 2017 | Sept. 6, 2017 | UAMS scientists believe they have identified an enzyme that could be manipulated to help stave off transplant rejection in patients following surgery. The findings of Lyle Burdine, M.D., Ph.D., transplant surgeon and assistant professor in the UAMS College of Medicine’s Division of Surgical Research and his research team — including postdoctoral fellow Ara Kim Wiese, Ph.D., and assistant professor Marie Schluterman Burdine, Ph.D. — were published July 27 in PLOS ONE, an online, peer-reviewed journal. The team uncovered a new role for an enzyme, DNA-dependent protein kinase, or DNA-PKcs, central to many immune system processes, most notably the production of IL-2 which regulates white blood cell activity. The majority of unsuccessful transplant surgeries are due the recipient’s immune system rejecting the transplanted tissue and attacking it. The team’s research included the study of a DNA-PK inhibitor, NU7441, a small molecule inhibitor. The study found that in the presence of NU7441, the production of IL-2 by lymphocytes, a subtype of white blood cells, decreased significantly. This could prove to be a successful method of immunosuppression, which is done deliberately after transplant surgeries to prevent the recipient’s body from rejecting the transplant. “Our results underscore an additional role of DNA-PKcs in the immune system and suggest that inhibition of this enzyme will likely have an immediate and profound effect on the maturation of lymphocytes as well as antibody formation,” said Burdine. The next step will be to see if suppressing DNA-PKcs following a transplant will help avoid a rejection from the recipient’s immune system. The team of UAMS researchers is starting pre-clinical studies this year. The work will take place in the new home of the Division of Surgical Research at the Arkansas Children’s Research Institute.